A new UNL mobile app — IrrigatePump — can help you identify irrigation pumping plants that are underperforming and need to be adjusted, repaired, or replaced with a better design. Developed by University of Nebraska-Lincoln Extension, this app (UNL A10001) uses existing records to help determine when pumping plants should be tested by a professional. An easy-to-use design guides the user to input six numbers related to pumping lift, pressure at the discharge, acre-inches of water pumped, fuel price, and total fuel used. The app then calculates a pumping plant performance rating. It also provides an estimated cost to bring the pumping plant up to standard and the number of years necessary to pay back the investment at various interest rates. This calculator compares the fuel used for your pumping plant with the Nebraska Pumping Plant Performance Criteria (NPC). A pumping plant meeting the criteria is delivering the expected amount of useful work, measured as water horsepower hours (whp-h), for the amount of energy consumed. The NPC is based on field tests of pumping plants, lab tests of engines, and manufacturer data on three-phase electric motors. Survey results in the past have shown many pumping plants used 30-50% more energy than expected by the NPC. Surveys of relatively new pumping plants indicate they're operating at 82%-92% of the NPC. Results are anonymous but can be captured and emailed to yourself. Another new University of Nebraska-Lincoln mobile app can calculate ownership and operating costs for your irrigation system. IrrigateCost models center pivot and gated pipe irrigation systems and the most commonly used energy sources. The user inputs information such as acres irrigated, pumping lift, system PSI, pump and pivot life, and inches applied as well as related costs such as for the well and engine, labor, energy, district fees, and taxes. 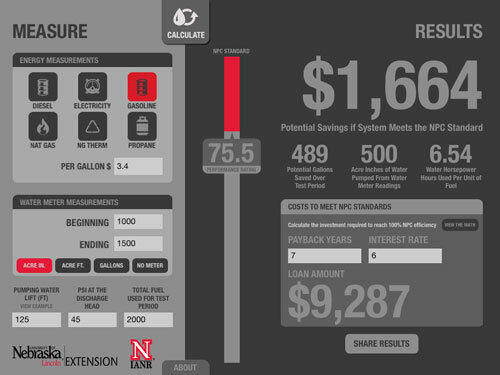 The app (UNL A10002) then calculates total irrigation cost as well as total ownership and total operating costs. It also breaks down costs by irrigation well, pump, gear head, pump base, diesel engine and tank and system and calculates per acre annual cost and per acre-inch annual cost. Results for different energy sources are displayed on separate tabs, allowing you to make side-by-side comparisons between energy options. The calculator is also helpful when computing a fair crop-share rental agreement. Parties often will list all the contributions required for crop production in a table (land, irrigation system, machinery, labor, crop inputs, etc.). By using two columns (one for the landowner and one for the tenant) costs can be determined for each on the inputs. The columns are totaled and a percentage is determined for the landowners and tenants contributions. The "fair" rental arrangement would be to divide the crop on the same percentage as the contributions that each party has made. The costs of owning and operating the irrigation system are some of the most difficult to identify when analyzing irrigated crop share arrangements. Much of the total cost of irrigation results from ownership costs and a large percentage of ownership costs are not annual out-of-pocket costs but rather hidden costs, such as return on capital investment, depreciation, taxes, and insurance. 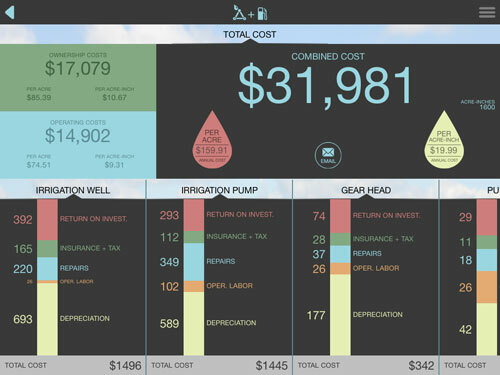 This app calculates ownership costs for each irrigation system component such as the well, pump, gear head, power unit and the irrigation distribution system. Knowing what to charge for watering a portion of a neighbor's field. This app can help you determine the ownership costs the neighbor should pay in addition to the operating costs for each acre-inch of water pumped. Estimating costs to pump an acre-inch of water to help you determine how many additional bushels of a crop are needed by applying one more inch of water at the end of the irrigation season. Results are anonymous but can be captured and emailed to yourself.